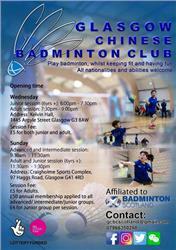 Glasgow Chinese Badminton Club is a family orientated badminton club which provides a means of family and community bonding through the sport. The club has three different levels of training, including advanced team (by selection), intermediate and junior teams with adult players. We have an aim to foster the promotion and development of the sport at the grassroots level within the community. Our core membership comprised of those from a Chinese ethnic background when it started and has diversified since then. We are open to all members of the public. Last Sunday we welcomed the team of Andy Bowman, Karen Stalker and Euan Murray who gave up their Sunday morning to come down to the GCBC juniors coaching session. As part of the Pathway Club Development Programme, we wanted to get feedback from them about how we could improve our coaching practices / content to coincide with junior national squad standards. Hopefully in the next visit they will be able to see how we have adopted the changes they have suggested, and it can really provide a strong platform for our juniors to develop the correct skill set for an advanced badminton player. A big thank you from the GCBC committee, coaches , assistant coaches and members to Andy, Karen and Euan for providing their insight and knowledge. We've recently had two excellent friendly matches against the University of Glasgow Badminton Team. On 10th March the University came out on top with 29 games against 19 for GCBC. And on 23rd March, GCBC came out on top with 32 games against 20 for the University. Thanks to our friends at the University of Glasgow and look forward to it again soon. We are back on as normal, so don't forget to pack your badminton gear for a fun filled session! See you down at Craigholme for some fierce games and intense training. © 2018 Glasgow Chinese Badminton Club. All Rights Reserved.